Fluoride is absorbed by the surface of the tooth, which includes the enamel covering the crown of your tooth and the surface of the root (cementum, see Parts of a Tooth), in the case of people with root exposure. Dental fillings called glass ionomers (see Fillings) also absorb fluoride and release it over time around the margins of the filling, helping to prevent future decay. Most over-the-counter toothpastes contain fluoride, and most dental professionals would recommend it for daily use. Today we have a number of products with higher concentrations of fluoride intended for daily use by individuals with a high cavity rate and tooth sensitivity. When your dentist or hygienist recommends a more concentrated level of fluoride mouthwash or toothpaste, it is given as a prescription. The prescription is used in addition to the topical application found in toothpaste and the fluoride applied by the hygienist during your dental appointment. Fluoride in mouthwash or toothpaste is a topical form of fluoride use; systemic fluoride is incorporated into the developing tooth bud prior to its appearance in the mouth. Fluoride mouthwash and toothpastes are a topical form of fluoride, and repeated use will not harm the teeth in any way. The phosphoric acid that is a primary ingredient in carbonated beverages (carbonated water, regular soda, and even diet soda). With repeated use, anything carbonated beverage will break down enamel. Saliva contains natural ingredients which work to harden (recalcify) areas of your teeth softened (decalcified) by acid from bacteria or food. Problems occur when this process cannot keep up with consumption of acidic fruit, fruit juices, carbonated beverages, and/or poor oral hygiene. 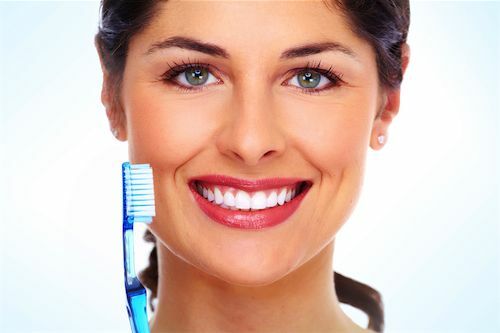 Regular use of the newly developed mouthwash and toothpastes can help keep your teeth stronger and healthier. The addition of xylitol to toothpaste, mouthwash, and even gum has revolutionized the battle against tooth decay. Xylitol does not kill the bacteria, but it renders the bacteria 1) unable to metabolize sugars, therefore they cannot produce acid and 2) it interferes with the production of the glue-like substance that helps bacteria stick to teeth. Bacteria that are unable to stick to teeth cannot damage the tooth. Antibacterial products kill bacteria and create an environment where bacteria cannot reproduce and adhere to surfaces of teeth causing disease. Most of these mouthwashes are intended to treat gum disease (gingivitis and periodontal disease). Bacteria cannot be permanently eliminated; the goal is to help control and reduce the number of harmful bacteria. Swishing with mouthwash never replaces brushing and flossing. For those patients who won’t floss, a capful of antibacterial mouthwash added to the water in the waterpik reservoir, sprayed between the teeth is a good alternative. There are a number of medical disorders and medications that cause the mouth to produce less-than-desirable amounts of saliva. When the flow of saliva is decreased, the number of bacteria in the mouth increases. When the number of bacteria is increased, the incidence of dental disease increases as well. A number prescription drugs – among them ones prescribed for high blood pressure, depression, anxiety, and heart disease – cause dry mouth (see Dry Mouth). Patients are often not fully informed about the problems that can occur when their mouth dries out. Saliva helps neutralize acid and supplies natural biological agents needed to harden and strengthen (recalicify) tooth enamel, so when saliva production decreases, these protections decrease as well. Decreased saliva permits bacterial numbers to increase which often leads to an increase in cavities and gum disease. Unless you have impeccable oral hygiene and have spent your early childhood in an area that supplied fluoridated water, the problem can be devastating. Mouth-wetting mouthwashes and toothpastes help replace the reparative properties of natural saliva. They contain salivary enzymes, antibacterial properties, and agents that help neutralize substances made by bacteria that cause mouth odor.